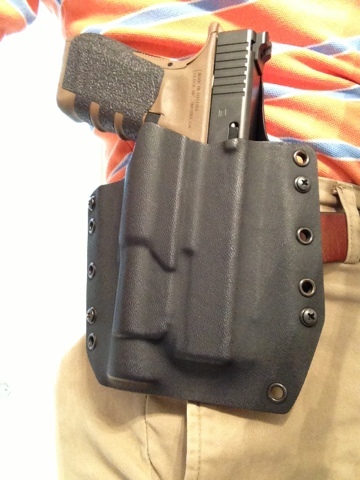 I got an awesome holster from Raven Concealment just the other day. The Phantom is their standard kydex OWB holster. The one I picked is custom molded for my Glock 17 with streamlight TLR1. I've recently gotten into weapons lights a little more, and I am really loving this 17/TLR1 setup. So far I like this holster, although it is incredibly tight straight from the factory. Breaking it in is taking a while. We'll see how it goes.